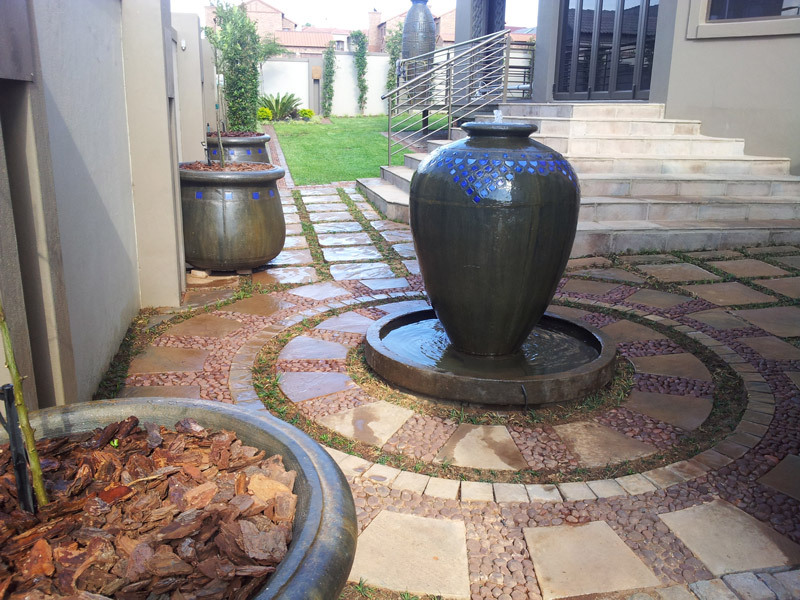 Aim for the design – LBL had to design the sidewalk of a very upmarket home in Moreletapark keeping the water restrictions and the terrible drought in mind. Our priority for the design was a good irrigation system. LBL installed a computerized irrigation system before the design commenced. 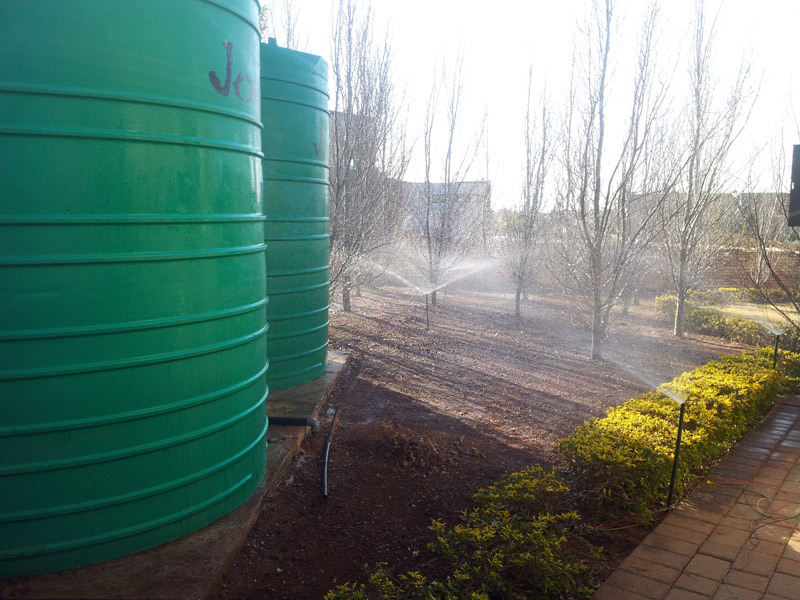 A good quality computerized irrigation system uses a lot less water than with a hosepipe. The area sloped down quite a bit and with the drought we had to level the area out for our irrigation water not to run down the road and go to waste. This meant that we removed cubes of soil the get the levels right. With the levels in place we decided to stick to the existing Syagrus romansofiana for height. The corner we accentuated with dark brown dump rock and bright yellow Acorus gold. The existing flower box with slate cladding gave our design the 3D look that was needed. In the rest of the sidewalk design we used the element of repetition. Cobbles was laid at an incline with a 1.5m space in between that we filled with mondo grass. LBL completed the design with kikuyu grass that was planted in the bigger open areas. Our objective was to design something around the swimming pool so that it complimented the existing design and also to be functional for entertainment around the pool. We decided to lift the entertainment area up one level to give the design a three dimensional feel without using expensive options. 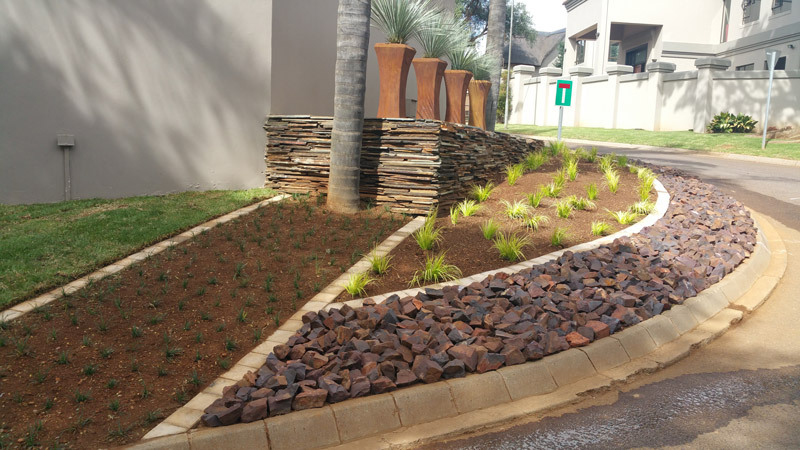 A small wall was built around the specific area and filled with filling and compacted, river sand was added and a new paved area was installed with a bullnose coping around the edges. The paved area was paved with big pavers and smaller cobbles in between. 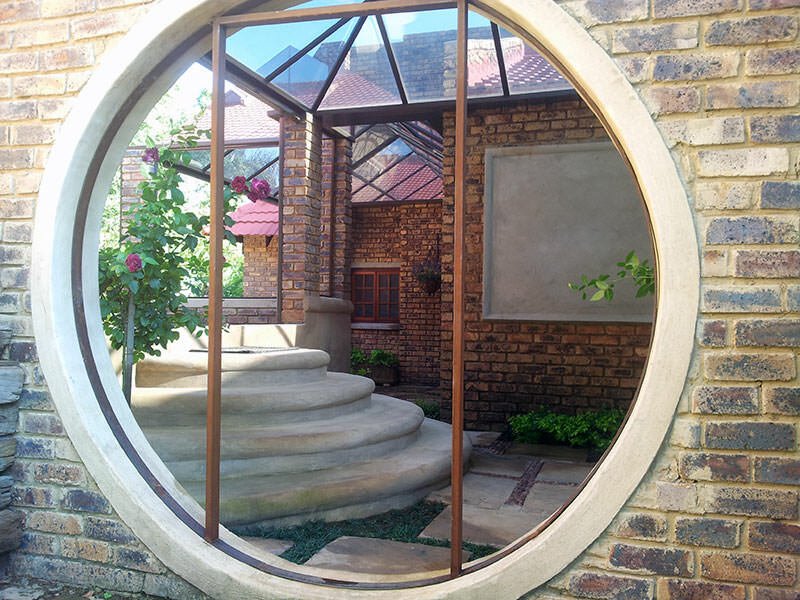 Projective for the design – to incorporate an outside shower area (filled with plant material) into the main bathroom & to renovate it into something spectacular. 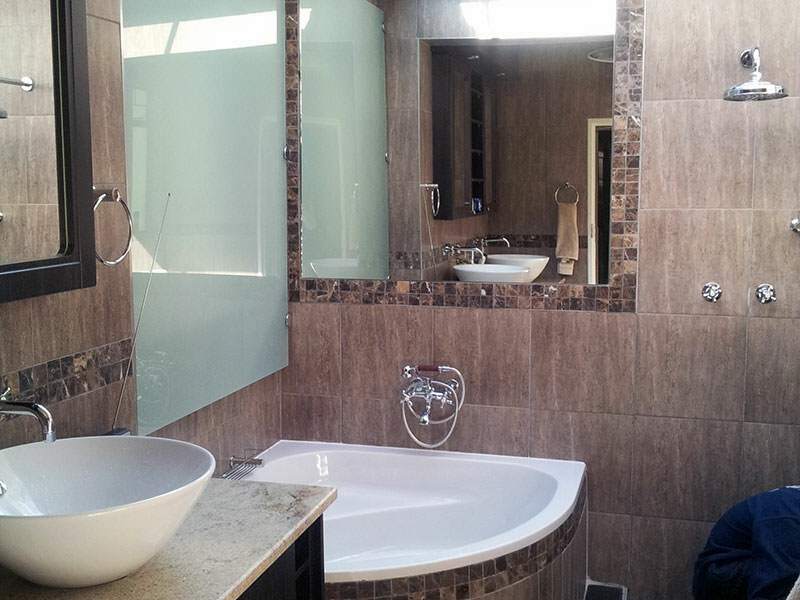 A very small bathroom consisting of a small bath, basin & water closet was renovated into a modern spacious area. The outside shower area was incorporated into the main bathroom by breaking down one of the existing bathroom walls, taking out all of the existing plant material in the outside shower area, build up the wall to the same level as the roof and to cover the roof area with a glass panel roof. The challenge was to hide existing piping of another bathroom running through the area as well as a bathroom window from the bathroom next to it. The idea was to hide the other bathroom window behind a frosted glass panel which will become part of the new renovated bathroom. The floor must be lifted up over the sleeves where-in the piping runs and the open area must be closed with a glass roof and small window. That makes our bathroom bigger with 10 square meters. His and hers sunken shower next to it that gives the design a very romantic feel (Bathing under the stars). Extra big shower heads with chrome taps complement the shower with the dark tiles beautifully. The area lends itself to a nice big vanity area where double free standing oval basins with chromed spouts coming out of the wall was designed and nice big mirrors to give the area more depth. Very modern custom made cupboards in a dark brown melamine was made to fit the need of this specific design, with stainless steel down lights for that extra romantic feel at night, but still a very modern look. 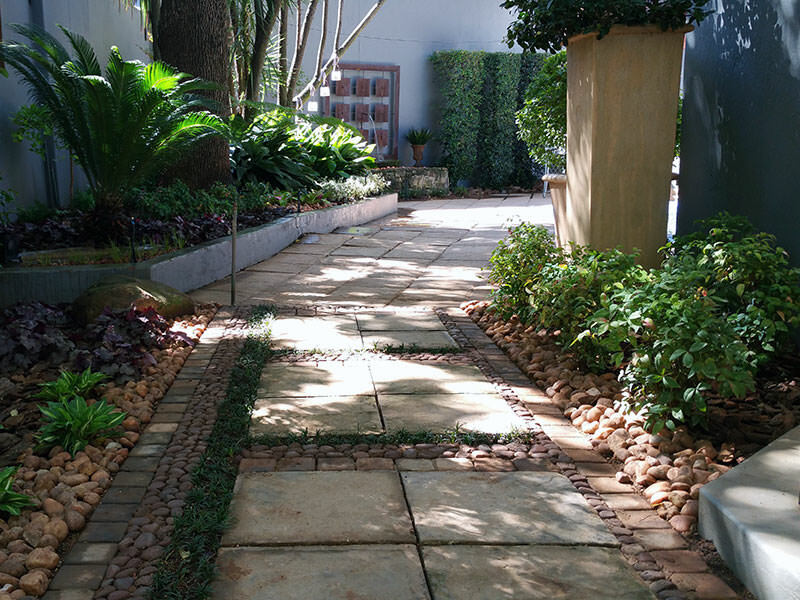 Light brown tiles for the wall were chosen with a natural stone border around the area to accentuate specific areas. The floor was done in a darker brown tile with the same natural stone tile for the sunken shower floor. A water closet in the opposite corner with a bidet spaced next to it finished the bathroom design off nicely.